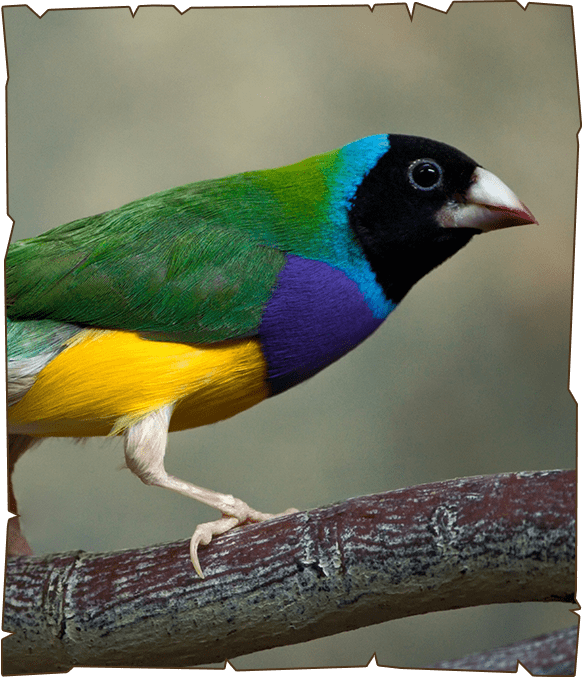 The Gouldian finch is an extremely attractive and strikingly coloured bird. Like many finches, this elegant bird has two tail feathers which are long and end in a point. Female Gouldian finches are less brightly coloured than males, and juveniles are also recognizable by their different colouration, having ash-grey heads, sides and necks, and olive-green backs, wings and tail feathers. The young develop the adult colours as they mature. The Gouldian finch is endemic to northern Australia, where it occurs mainly in the north-west regions of the Northern Territory and in the Kimberley region of Western Australia. It has also been occasionally recorded in Queensland.